I’m a day early as I won’t have time tomorrow - I’m off to see an Air Show. So we’ll have a Samurai Saturday instead of a Sun-Day. And today’s feature is all about the little machine that went on to move millions - the Daihatsu Midget. The first Midget was introduced in 1957 - and it was more than a little basic. It was a single-seater, door-less mini-trucklet, with handlebar steering and a two-stroke 250cc one cylinder engine. And despite the engine’s measly 8hp, it was rated to take up to 300kg of cargo! Over the years, both the engine and the body grew. Doors were added, a steering wheel replaced the handle bars, and a few basic creature comforts were added. By 1962, the final version you see here was launched - the MP5. The engine now had 305cc and power was up to 12hp. And this version remained in production until 1972, when there was no longer any demand for three-wheelers. Like so many other micro cars, post war prosperity had caught up with it and people were ready to move on to bigger and better things. 330,000 units had been made, that was a pretty good run. But that number just reflects the amount of cars made by Daihatsu in Japan. So what about my claim then that this car moved millions? As is so often the case, basic, cheap transport is in high demand in developing countries, and so the Daihatsu was produced in large numbers in a bunch of other Asian countries as well. Thailand was the first one in 1959 - where the Midget models became the basis for that country’s famous “tuk-tuk” - the three wheeler Taxis that still str in use. In India, it became the “Bajj. So it truly moved millions, and continues to do so today. And the story still doesn’t end there. In 1996, Daihatsu launched the Midget II - a kei mini truck which was the spiritual successor. But that was four-wheeled and only lasted until 2002 - not quite the same success as the original. But we are still not done yet! If you want to, there are still no less than three companies in Thailand that will build you a brand new Midget if you so desire. You even get a few more horsepower. Just you probably won’t be able to register it in your home country. 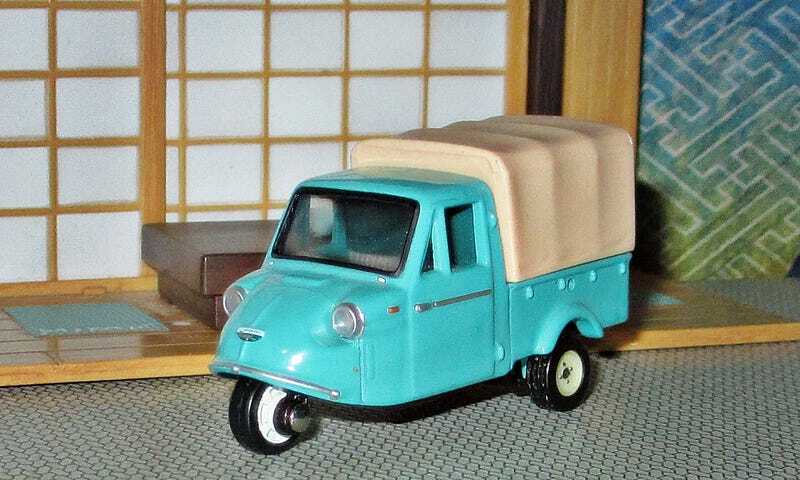 The model is a Tomica Limited from 2002. The original casting dates back from 1980 and was in the line-up until 1984. It was one of the few instances where Tomica introduced an old car into its Regular 1-120 line-up - normally only contemporary cars are part of that. It has also been re-issued numerous times due to its popularity. And if you wonder what a Midget would be like to drive, check out this video. The driver is clearly a master behind the Midget wheel. He gets it up to amazing speeds, and his pedal technique, double de-clutching his way through the un-synchronized gearbox, is truly amazing. Enjoy!